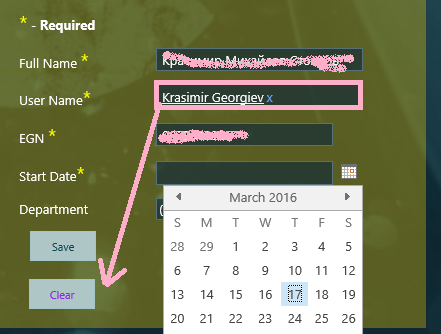 How to clear ClientPeoplePicker field from a button click event handler? I am building a custom form that includes a ClientPeoplePicker control. When the user press the Clear button, all the fields in the forms should be reset to empty/initial status. I can do this for all the fields except the ClientPeoplePicker one. InitialHelpText="Please, insert a valid User!" Just add this single line of code which will clear the PeoplePicker field. Not the answer you're looking for? Browse other questions tagged clientpeoplepicker or ask your own question.